Cute but destructive… We breed blue heelers and they just turned 6 weeks old. Soon two will be going to a new home and this time we are keeping the little guy above. How much can he tear up right??? Love the wicker chair! 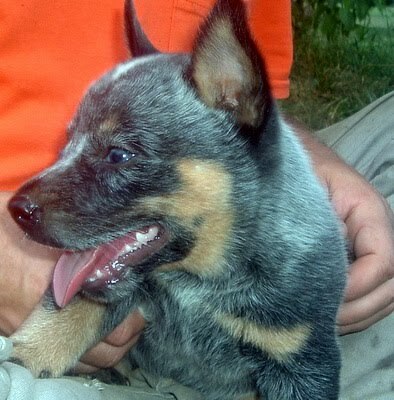 And what a sweet looking puppy! Oh, he’s just so cute! 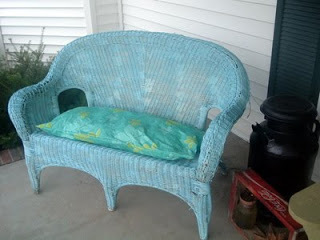 I have to make a cushion for my porch swing…Any suggestions?! It must have felt so good to get that last (the 10th) project completed. Honestly, you deserve a big pat on the back! Love that idea! Thanks for sharing @ Anything Related! The chair turned out great and I love the picture of the puppy!! My partner in crime and I left an award for you on our blog! I never thought of using a plastic table clothe, what a great idea! Another nice job, Angie. I’d love if you’d link up with Fabric Fun Thursday :). great:-) Thanks for your post.